The American Board of Internal Medicine (ABIM) is providing more choice to physicians who are maintaining board certification. ABIM is taking this important step because physicians have asked us for more flexible options that affirm to themselves, their patients and peers that they are staying current in medical knowledge. As ABIM re-thinks the process for continuous certification, we do so in collaboration with the Internal Medicine community. All 200,000 ABIM Board Certified physicians, as well as 27 medical societies, were invited to share input. This first phase of dialogue guided the ABIM Council, a body of practicing physicians from several internal medicine subspecialties, to update the assessment process. Short assessments every two years emerged as the option that offers physicians the most choice, relevance and convenience as they maintain certification— and confidence that they are staying current. Physicians will be able to choose to take assessments every two years or every 10 years. Beginning in 2018, physicians certified in Internal Medicine can choose to take shorter “knowledge check-ins”—at the location they choose—every two years. ABIM will share updates on availability of these options for subspecialties in the coming months. You can choose to take the two-year assessment on your personal or work computer – or at a testing center. You do not need a passing score on every two-year assessment. However, if you are unsuccessful twice in a row or if there is a longer gap between assessments, you will need to take additional steps to maintain certification. You will have more dates from which to choose when scheduling the two-year assessment. This “knowledge check-in” offers more continuous learning, feedback and improvement. Results will be available immediately after the assessment. More feedback will follow. To assist physicians with adjusting to changes—and for ABIM to learn from the process—there will be no consequences for unsuccessful performance on the two-year assessment in 2018. Physicians can still choose to take an assessment every 10 years in a testing center. ABIM is continuing to collaborate with physicians to make this option more reflective of practice. You might have questions about how this will impact you: Please read comprehensive FAQs on ABIM.org. These are just the next steps in ABIM’s ongoing evolution. We are simultaneously exploring other changes you and your colleagues requested: Making two-year assessments open book; focusing assessments on a subset of knowledge relevant to practice (versus breadth of knowledge in a certain discipline); and exploring partnerships with societies to create additional options. Thank you for working with ABIM to build more flexibility into a certification process that is based on standards that everyone can trust. 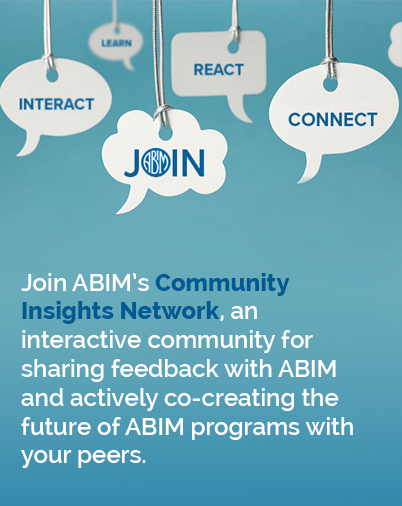 Please continue to contact us with questions and subscribe to the Transforming ABIM Blog for updates.